Vibration: how useful tools turned men into fools. | Helping the best to get better! Vibration: how useful tools turned men into fools. It was during the summer of 1994, when I visited one of my mentors, prof. Carmelo Bosco.Somehow we came to the observation that kids when awake often fall asleep when put in the backseat of the car and wondered if it was the noise or the vibration of the car engine that caused this to happen. We came to the conclusion that is must be the mechanical vibration of the car on the road. But then, what could be the effects of vibration e.g. on the central nervous system or even on the muscle. The effects of local vibration on muscle function were already known in the beginning of the 20st century, but we were talking whole body vibration. Now there were very few useful vibration platforms on the market at that time.There was only the Galileo, which worked through the see-saw principle, but little research had been done. Carmelo decided to do research on the effect of whole body vibration with that platform. But he was not satisfied with the design so he designed his own machine, the first vertical vibration platform or Nemes: NEuromuscular MEchanical Stimulation. We were not happy with the Galileo machine, because the frequency range for training effects was too low for most athletes (< 30 Hz), secondly the machine was way too heavy 100 kg, to carry, and the see-saw board broke when I put the players of our Olympic volleyball team on it. I clearly remember the fun we had working on the first primitive prototypes. 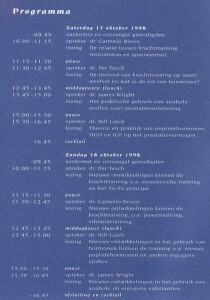 Carmelo for the first time used the term “vibration training“ in a congress we organised in Holland in October 1998. Working with vibration on elite athletes we did a lot of measurements on explosive strength, power, and EMG to study the effects of vibration and to establish optimal setting of parameters. But because of the excellent results, more people got interested and Carmelo had to manufacture more machines, for commercial purposes. Now none of us had a commercial background or any experience in selling equipment, we were probably the worst businessmen in town. The machines did not look too flashy but at least they worked very well. So we started to sell machines without really knowing how to do that, but at least our intentions were good. We sold machines that worked and we could prove it. Since I lived in the Netherlands people close to us caught the idea too. A guy who called himself “ Olympic coach”, but could never show an Olympic coach’s accreditation, bought a few Nemes machines, but claimed they did not work. Strange, because we tested all these machines ourselves with use of EMG. In the end we knew what he did, taking them apart to see the construction in order to copy them. A vibration machine cannot be patented adequately, because a small difference in design or construction would be enough to go around the patent. I wrote an article in the journal Runner’s World and a few weeks later a friend who had read the article asked me if I wrote it, because somebody else’s name was on top. And indeed, the “Olympic coach”, who had try to sell “homeopathic testosterone” a.k.a. tap water before, had copied the article to sell his own machines and had scratched my name away and put his name instead. In the following years many things happened, it looked like every person with a toolbox tried to make his own vibration platform in his garage. Vibration business seemed to be booming. Funny enough very few people had a clue about what it did, why and how to use it and what the side effects could be. Mostly they copied the content of our websites and claimed outrageous results, even for all kinds of physical problems. But in the meanwhile we received many reports about machines that did not work or about side effects caused by vibration. In 2002 I wrote a small book about vibration training and its use. Looking back after 15 years of whole body vibration we see that the application is hardly used anymore, vibration centers (“get fit and slim in 10 minutes, no sweat”) closed down and a new generation of coaches and athletes is barely aware of the use of vibration. Just some late adapting scientists are still doing research but nothing really new or interesting is brought forward. I am happy not to be involved in vibration platforms for the last couple of years. How was it possible for a good and useful principle lost ground so fast? the amount of lies and confabulations told about vibration platforms, “that have been use in space’, or “have specially designed frequencies for optimal results”. There are only so many lies the consumer will accept. You can fool somebody all the time and you can fool everybody one time, but you cannot fool everybody all the time. one of the main problems we found was that everybody has an individual optimal frequency that leads to results, but this could only be tested by using EMG. 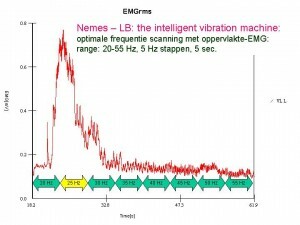 That is why Carmelo developed the “intelligent vibration system” which through an integrated EMG test, tells you with which frequency you have the optimal training response, for some athletes that will be at 20 Hz, but for others it might be at 45 or 50 Hz. in the end the greed of a few producers lead to fraud, bankruptcies, and loss of trust of the potential consumers, and the decline of a potentially useful training system.